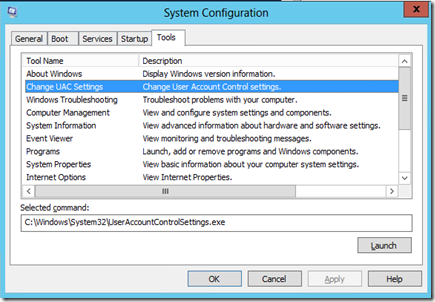 How to install SharePoint 2010/2013 single-multiple servers using AutoSPInstaller? Which Service Accounts are used and why they are needed for SharePoint Server and SQL Server Installation & configuration? What should we take care while Configuration of AutoSPInstallerGUI? You can get base architecture knowledge on which SharePoint works and why each configuration is needed for SharePoint Installation? 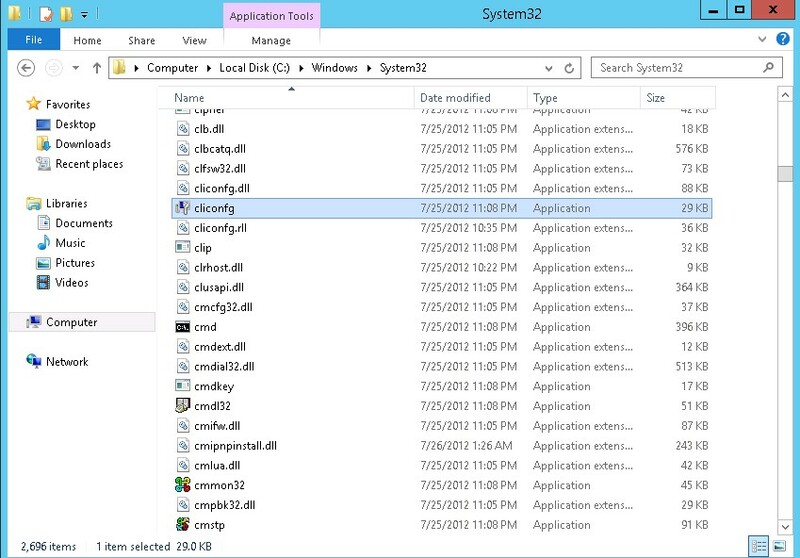 Recently I have installed the SharePoint Server 2013 on multiple servers. First I will define my Environment. So it’s helpful for understanding the Server’s Architecture. You can add web servers (SPWEB1, SPWEB2) to the web tier. These servers can be configured as conventional web servers to handle user requests, or they can be configured to host dedicated query components or other service components. 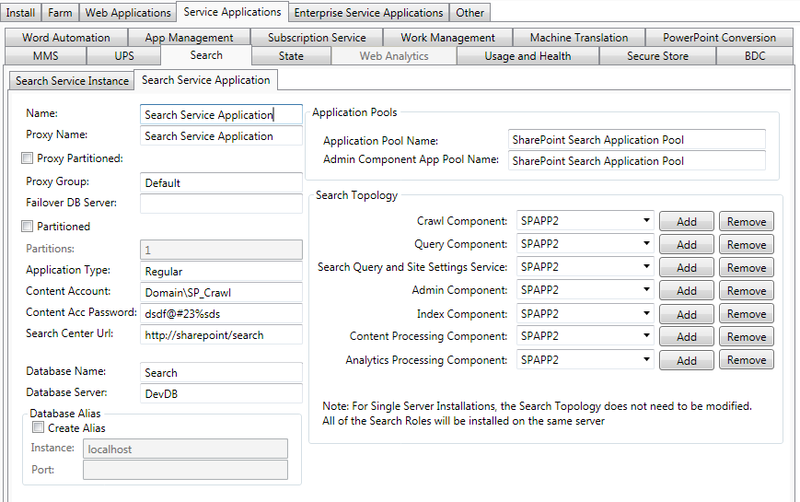 You can add application servers (SPAPP1, SPAPP2) to the application tier and configure them as dedicated servers that will host the SharePoint Central Administration website or other services on the farm that require dedicated resources or isolation from the web tier — for example, crawl components, query components, and profile pages. You can add database servers to the database tier (SQL) to implement a stand-alone instance, database mirroring, or a failover cluster. To configure the farm for high availability, database mirroring or a failover cluster is required on the database tier. Why we need Service Accounts while installing and configuring the SQL Server and SharePoint Server? If the Service Accounts cannot configure properly while SharePoint Installation and configuration then they can open big security problems. So need to set up the accounts as per the security risk. 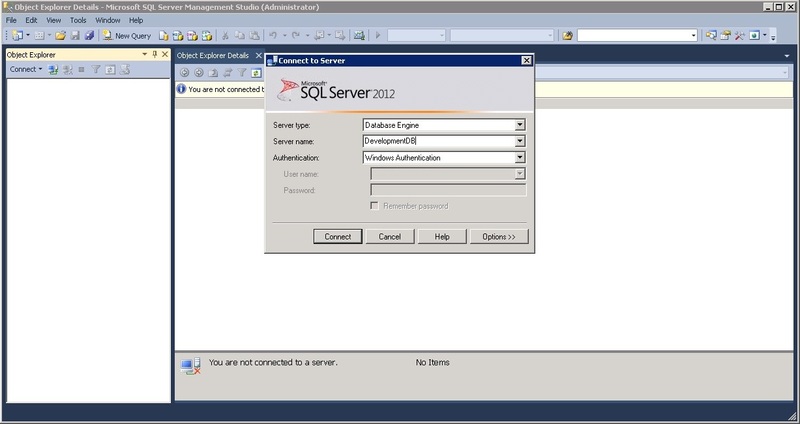 First I have installed SQL Server 2012 R2 on SQLDB server. After completing the SQL Server installation, you need to set up SQL Server Alias for SQL Server for Remote access. So we can directly connect to SQL Server using the given alias name instead of the SQL Server Instance name. 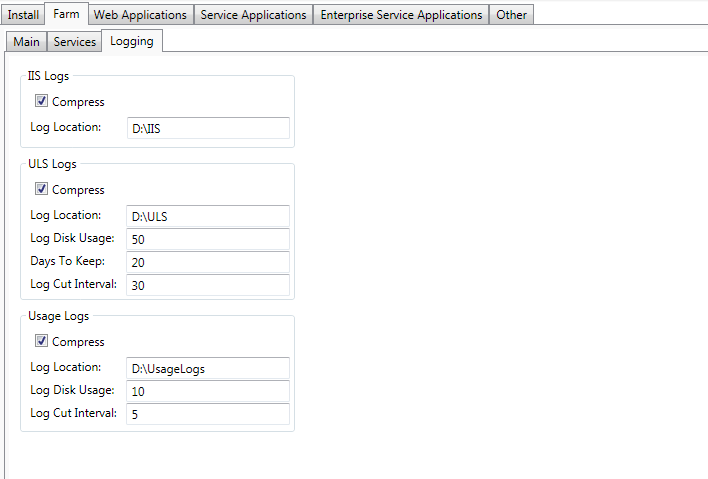 Here I have created SQL Server Alias named “DevDB”. Configure and manage the server farm. 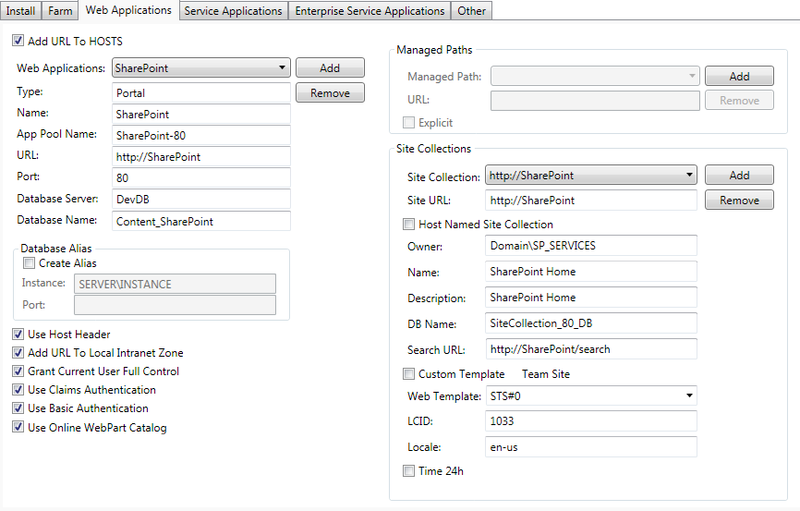 Act as the application pool identity for the SharePoint Central Administration Web site. Run the Microsoft SharePoint Foundation Workflow Timer Service. SP_UserProfiles The User Profile Synchronization Account None Replicate Directory Changes permission on the domain. AutoSPInstaller is an open source set of PowerShell scripts that installs and performs a base configuration of SharePoint Server 2010 or 2013. These scripts were originally authored by Brian Lalancette and Andrew Woodward as well as other community contributors. It configures a single or multi-server SharePoint farm based on a predefined configuration XML file. 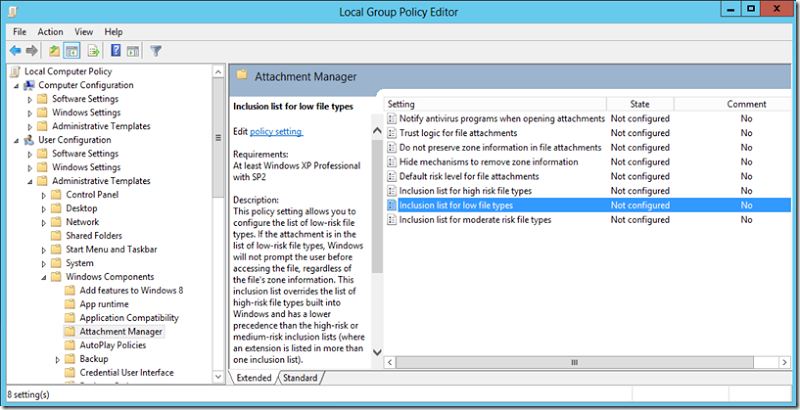 For Multi-Server deployment, Provides the Sharing access on extracted folders of AutoSPInstaller. So all other SharePoint Servers can access it while installation. Online Mode: In Online mode, it will automatically download Prerequisites files from internet. Then Open your SharePoint 2010 installation media and copy it to SharePoint Folder. Why we to use AutoSPInstaller? Repeatable procedures for deploying staging and development environments to mirror production. Why we to use AutoSPInstallerGUI? AutoSPInstaller’s configuration required very high knowledge of the PowerShell, SharePoint Architecture, Active Directory and most important accuracy. Because it only contains the PowerShell Script. But if you know basic level of SharePoint Structure, then by using the AutoSPInstallerGUI, it is possible to configure the single server/multiple servers SharePoint Installation. AutoSPInstallerGUI is a Windows application that helps you build this configuration XML file with useful tooltips, tabular GUI, and error checking on your inputs. 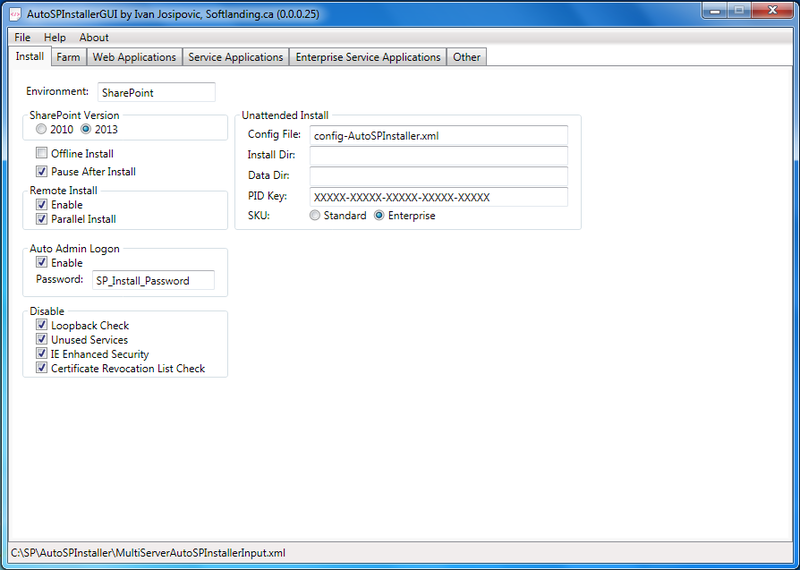 AutoSPInstallerGUI is built and maintained by Ivan Josipovic. Both of these projects are hosted on Codeplex and are free to use. Extract both file and put it in right place. 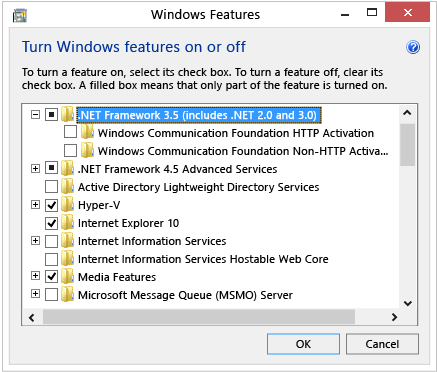 Then you just have to enable .NET Framework 3.5 in just current server where AutoSPInstaller is running. You have to perform below settings on all the SharePoint Servers (SPWEB1, SPWEB2,SPAPP1,SPAPP2) for Unattended SharePoint Install. 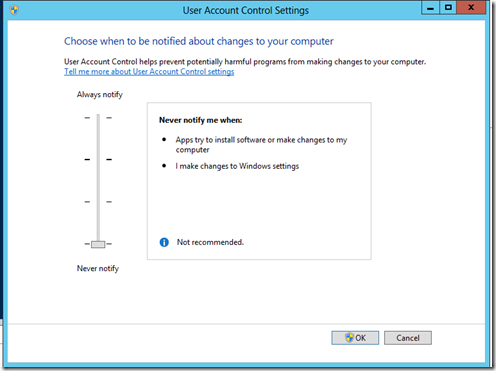 Select Tools” tab and Launch “Change UAC Settings”. Redirect To : User Configuration => Administrative Templates=> Windows Components=> Attachment Manager=> Inclusion list for low file types=> add ”exe;” to the list. Configure the AutoSPInstaller XML file using the AutoSPInstallerGUI as below and run the AutoSPInstaller .bat file on the SharePoint Application Server (SPAPP1). You only have to run the AutoSPInstaller script from a single server. It will go out and run itself on all other servers in your farm. The first server will install itself, create the farm and the service applications and in the end connect to the other servers. 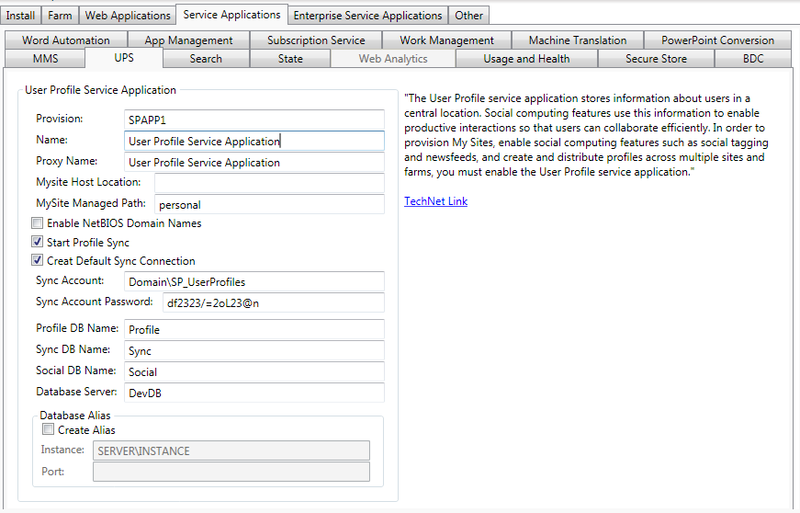 Currently I am logged in with “SP_Install” account on “SPAPP1” application server (which is local admin on all SharePoint Server and also has SQL Server Permission with DBCreate and and SecurityAdmin). Note: Use server name (i.e. SPAPP1) instead of the localhost. Multi Servers Install: If you want to install service on multiple servers, then specify the comma separated server names (i.e. SPWEB1,SPWEB2) as below shown. Offline Install If enabled, SharePoint prerequisite will be installed from SharePoint\SharePointPrerequisite FolderIf disable, SharePoint prerequisite will be downloaded during install. 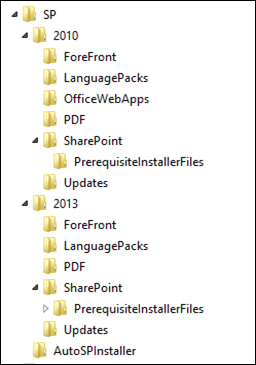 Don’t need to put prerequisite in SharePoint\SharePointPrerequisite Folder. Just enable the internet. Pause After Install It’s useful for multiple remote server installation. The script will pause after SharePoint binaries are installed. Parallel Install: Override the “Pause After Install” option and install SharePoint binaries on multiple remote servers simultaneously to speed up the things. Auto Admin Logon For automatic log on using SharePoint install account at server restart while SharePoint binaries Installation. Disable Check all the options for smooth execution. 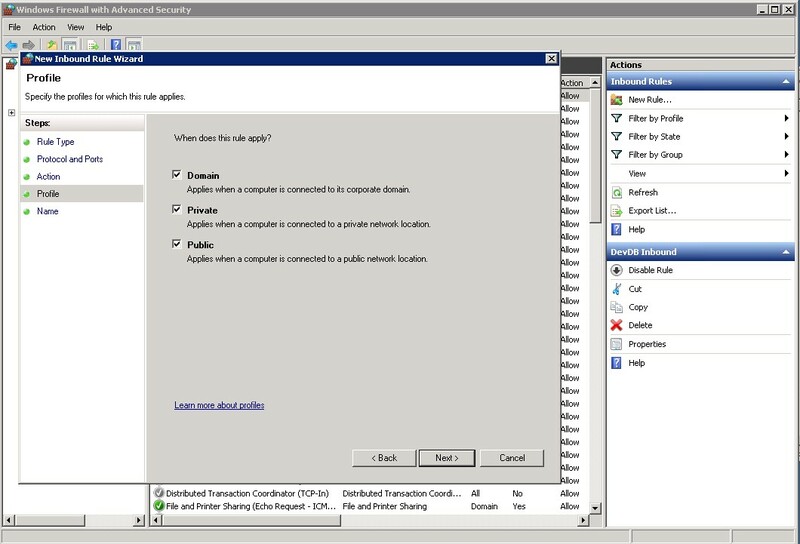 Which disable network loopback check, disable unused services while installation. 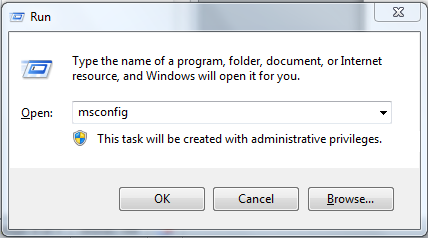 Unattended Install Config File: Create automatically if not specified, contains configuration used while installation. Data Dir: define the place for SharePoint 14/15 hive. PID Key: SharePoint Server Product ID Key. Farm Account Add To Local Admins During Setup: Add farm account to local admin group of servers and required for UPS Application. Create Alias: don’t need to create alias if you have configured alias already as in DB server. Central Administrator Provision: Which on which host the Central Administrator Web Application. Preferred, Application server (“SPAAP1”) is used to host the central admin or you can say that where the CA is configured that server is called as application server in SharePoint multi servers. Port: Port number on which CA will run. 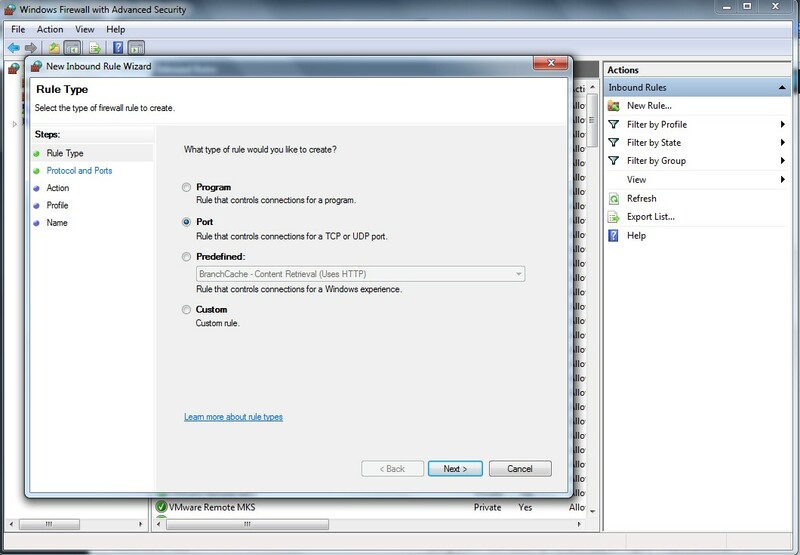 Use SSL: Automatically create SSL certification if SSL enable. Type Web Application Type, you can use Portal or MySiteHost as per the Application.One Web Application should have this type at a time. App Pool Name Application Pool Name under which the Web Application will run. URL Web Application Host Header. All Site Collection will begin with this name and please choose http:// or htttps:// carefully. Do not add port number. It’s below. Database Server Provide the SQL Server or Alias Name as configured above. By default it will take farm database server. Database Name Content Database Name for the Web Application. Use Host Header If Checked, then web app URL will be placed in IIS Bindings. 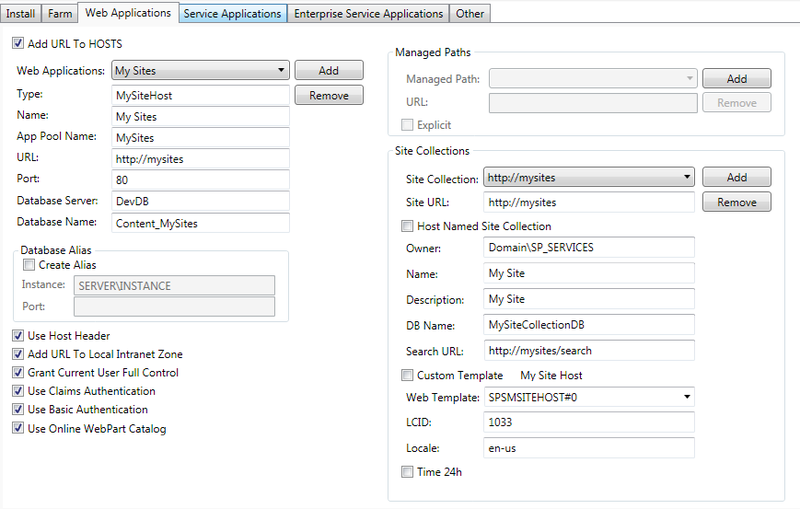 If you configure the same host named site collection (http://SharePoint), then do not need to enable. Add URL To Local Intranet Zone If checked, then while browsing the web app, it will not ask credentials. Grant Current User Full Control: Provides current user all control on web app. Site Collection We can add/remove multiple site collections per web application using this GUI. Host Named Site Collection: Enable to create Host named site collection. Owner: Site Collection Owner Account. It’s required. Otherwise script will fail. DBName: Content DB of site collection, IF not specified then, it will use Web App Content DB by defaultSearch URL: Search center URL. Custom Template: we can choose custom web template for the root web for site collection. Currently I have selected Team Site Template. 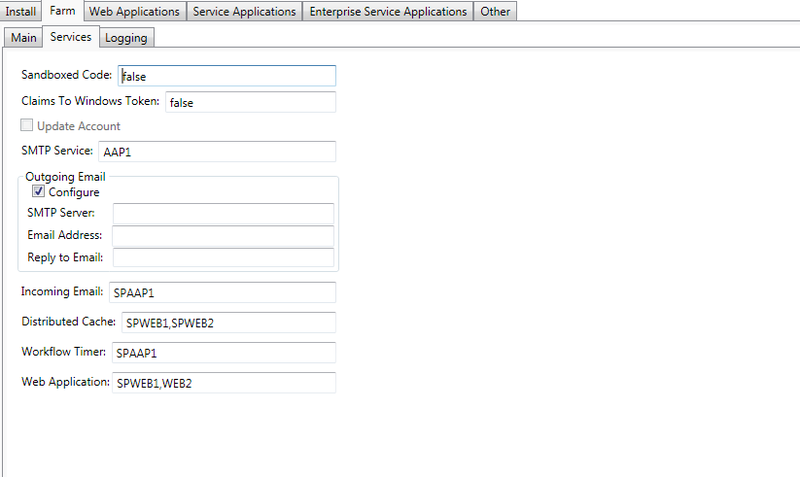 Step 6: Configured the Search Service Application on Separate Application Server (SPAPP2) and All Other Services are on other Application Server (SPAPP1). Connection Timeout: In Seconds, wait to crawl contents, links. So please assign value carefully. Not too high, not too low. 60 seconds are recommended. Acknowledgement Timeout: how long wait for request ack. Contact Email: For contact content admin if crawl error or performance error occurs. Content Account and Content Acc Password: This account is used for Content Crawling. Search Center URL: Default search center URL for all site collections. Database Name, Database Sever: Search Service Database Name and DB Host Server Name (Alias Name). Application Pool Name and Admin Component App Pool Name: Application pool name under which search service will run. UPS User Profile Service also need the Provision server name, Service Name, Proxy Name, Content DB names for Profile, Sync and Sync and Database Server name as configured in Search Service. Start Profile Sync and Create Default Sync Connection for starting the service and creating the sync connection between AD and SharePoint Servers. 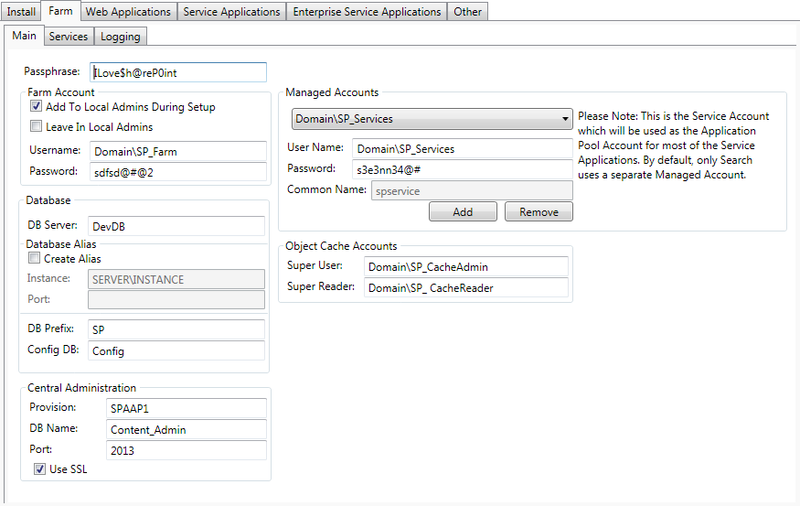 BDC, MMS and App Management Services Service need the Provision server name, Service Name, Proxy Name, Content DB names for Profile, Sync and Sync and Database Server name as configured in Search Service and UPS.Now all other services have the same configuration as above. You can configure the five Enterprise Service Applications of Excel, Visio, Access 2010, Access 2013 and PerformancePoint Service by provide the Host Server and Database name, Service Account Name like below displayed the Performance Point Service Configuration. After completing the AutoSPInstaller configuration, You can save as XML file as “DevAutoSPInstaller.xml” in the AutoSPInstaller folder as shown in figure. I have taken the different name, because I can use the actual “AutoSPInstallerInput.xml” file for reference. Before running the AutoSPInstaller PowerShell, Please make sure that you logged with with “SP_Install”(which is local admin on all SharePoint Server and also has SQL Server Permission with DBCreate and and SecurityAdmin ) account in your server. Currently I am logged in with “SP_Install” account on “SPAPP1” application server. Now, Drag the new XML file “DevAutoSPInstaller.xml” into the AutoSPInstallerLaunch.bat. If you directly run “AutoSPInstallerLaunch” bat file, by default it will use “AutoSPInstallerInput.xml”. So take care while running the bat file. What is SQL Server Instance and SQL Server Alias? Why we are using SQL Server Instance and SQL Server Alias? How to create and configure them? Client applications connect to an instance of Microsoft SQL Server to work with a SQL Server database. An instance is either the default, unnamed instance, or it is a named instance. When SQL Server is installed in the default instance, it does not require a client to specify the name of the instance to make a connection. The client only has to know the server name. A named instance is identified by the network name of the computer plus the instance name that you specify during installation. 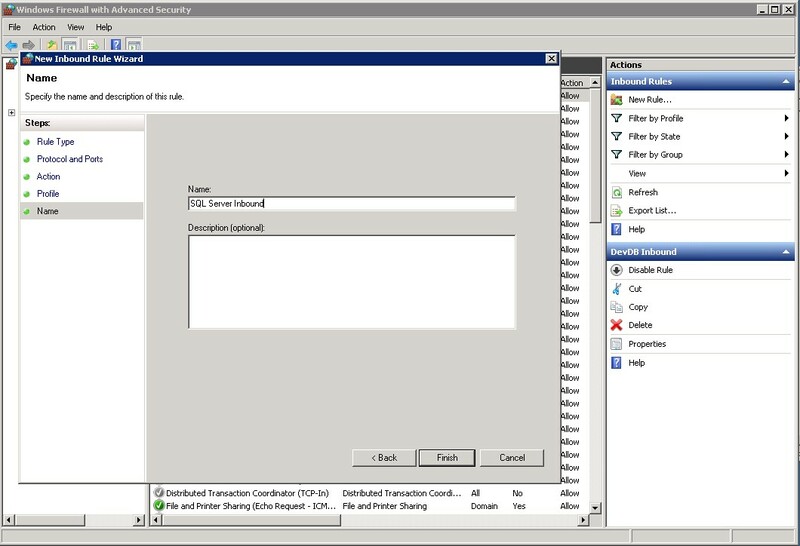 The client must specify both the server name and the instance name when connecting. You can install only one default instance but can install multiple named instances. It is good to install only a default instance unless you have a special need to install multiple SQL Server instances on the same host, such as running different versions concurrently or other isolation requirements. These additional instances must be named. The underlying difference between a default and named instance is mostly a matter of network connectivity. Clients can connect to the default instance using only the host name over the well-known 1433 port. To connect to a named instance, clients specify the host and instance name (e.g. ” MY-MACHINE-NAME\MSSQLSERVER”) and the SQL Server Browser service returns the port the named instance is listening on. A SQL Server alias is simply a friendly name or nick name, configured on the client computer that points at a SQL Server instance. This instance can either be installed locally or on a different machine on the network. Note: For that we need to configure the SQL Server Alias on the SQL Server, after that we can use the SQL Alias name instead of the SQL Server Instance name. 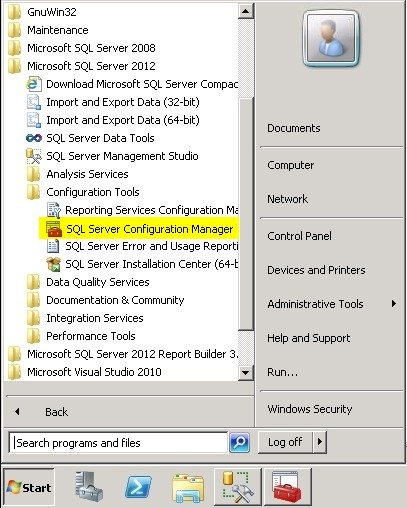 Step 2: Verify the SQL Server (MSSQLSERVER) Service is running under the SQL Server Service option. Step 3: Verify the TCP/IP Protocol is enabled for the SQL Native Client 11.0 Configuration (32bit) and SQL Native Client 11.0 Configuration tree. Step 4: Create the new alias, Right click and select new alias under Aliases of SQL Native Client 11.0 Configuration (32bit) and tree. • Port no, by default SQL Server uses 1433 port number. You can also specify other port number as well. • I have default Instance named “MyDBServer”. This is the scenario where you have one machine or server and you have successfully created SQL Server Alias. One more beneficial use of SQL Server Alias is for the multiple servers’ environment like SharePoint Multiple Server Farm. 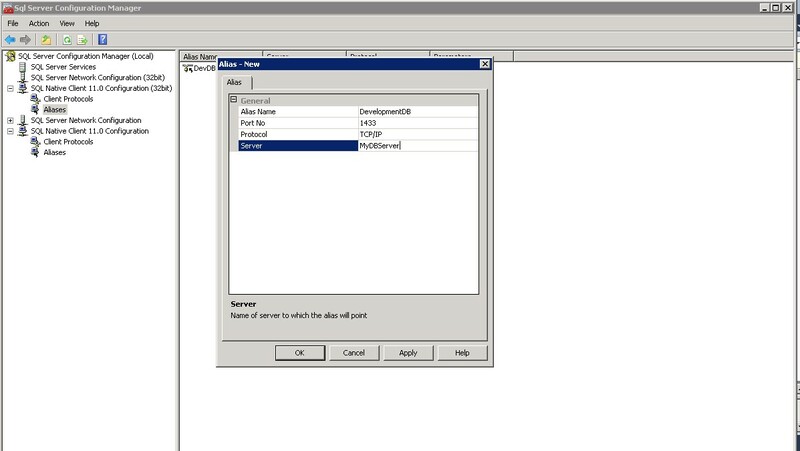 Below Configuration, We have to do on the SharePoint Server “MySPServer” to connect to the SQL Server of “MyDBServer”. 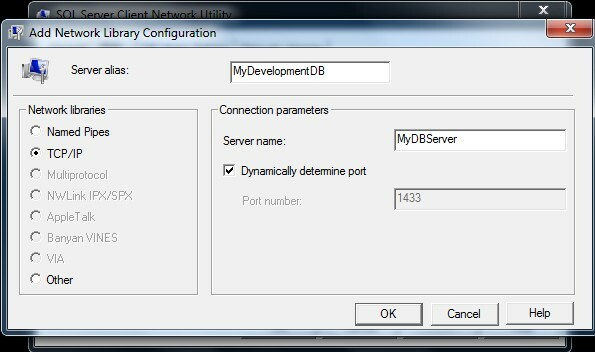 We have already created alias named ”DevelopmentDB” on the server “MyDBServer”. 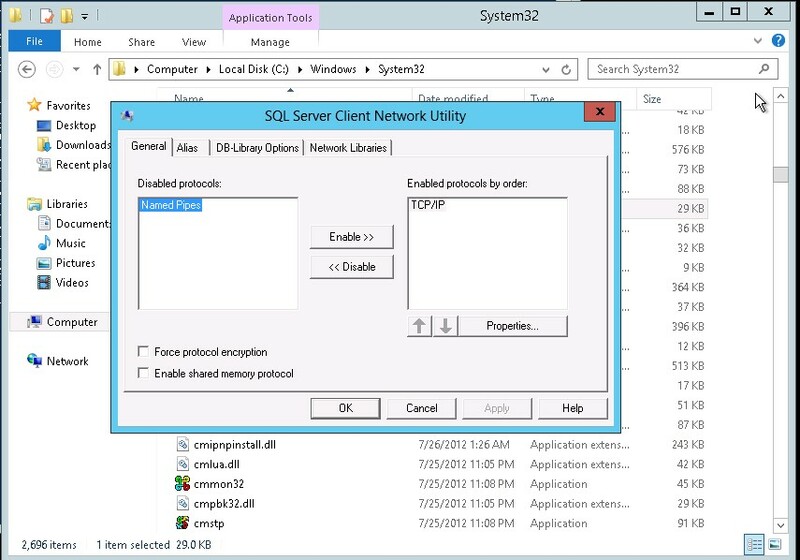 Step 1: If you haven’t installed the SQL Server 2012 client tools, you can still create an alias using the SQL Server Client Network Utility. To bring up the utility, click on Start, then run, and run cliconfg.exe. Step 3: Go to the Alias Tab to create a new alias, click on the Add… button. One more thing we need to take care is about the Port Number. 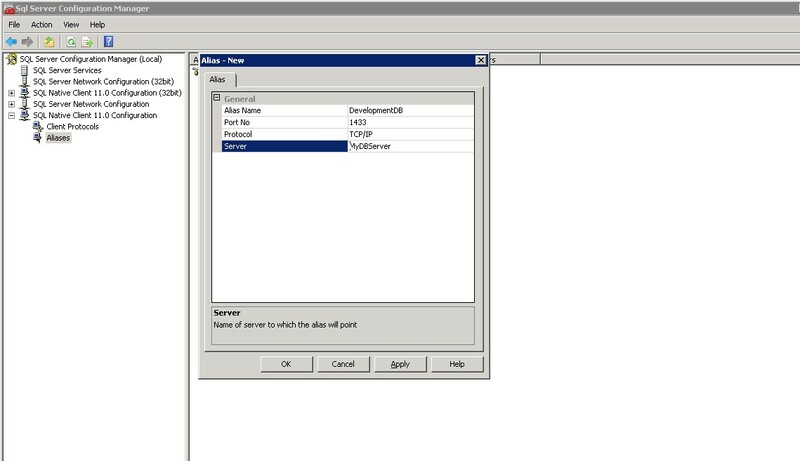 When we configure the port number for SQL Server Alias Name then server does not allow the out side server connection on this port because of the Firewall Settings. So our next step is open the custom port for inbound connection if firewall is enabled. Step 1: Open Windows Firewall with Advance Security from the Control Pannel. Click on the “New Rule” of Inbound Rules Tab. Select the Rule Type as “Port”. Click Next. Step 2: Domain Rule apply for To TCP and Provide the specific port number (1433). Click Next. Step 3: Apply the Rule on the Profile, Click Next and allow the connection. Step 4: Provide the name of the inbound rule, Click Finish. Let me know if you have any suggestions or questions.